NEW LOWER PRICE!!!! As of June 18th at 4pm- the manufacturer has lowered the overall cost and we are able to pass the savings on to you! Nothing has changed regarding the manufacturing of the brush- but the price is lower! Hurray! This Ultimate Waxing Brush has darker hairs. SAME texture and feel and performance as the light colored brush, but this one is great for your Dark Wax applications. You will never grab the wrong brush accidentally now by using Dark Haired Wax Brush when using your Dark Wax! The Ultimate Waxing Brush is the one tool I highly recommend to my customers to have in their painting pantry or painting toolbox, especially if you think you will be doing more than one project. If taken care of, this brush will need to be noted in your will since it will last forever! If you plan on using both clear and dark wax- it is HIGHLY recommended you get TWO (I like the 1 1/2 inch wax brush that is $19.95 to use with Dark Wax.) We suggest two brushes otherwise you could contaminate a clear wax piece you are working on if you did not thoroughly remove all of the Dark Wax from your bristles. (Consider watching my video on how to apply wax- see that by clicking here) The Ultimate Waxing Brush has a comfortable wooden handle that fits nicely in your hand and the ferrule is made of nickel-plated steel guaranteeing no rust. The 2" long 100% Shanghai White Bristle, the finest available, is solvent proof, double set in epoxy and combed twice to ensure little bristle loss. With that said though, you should be aware that often the first few times you use your wax brush, bristles will come out. When you see a hair in your wax, pick them up by coming at them perpendicular with your wax brush. Once the hair is on the tip of your brush, just pluck it off with your fingers. If you give the brush a rigorous cleaning a few times prior to using, you can minimize the bristle loss, but over all it is not a horrible thing and bristle loss in the beginning is just going to happen. <> Again, if a bristle comes out while waxing, using my ultimate wax brush, I hold it and come at the loose bristle from a perpendicular direction (like a "T" shape.) I gently use my brush to grab the bristle and lift it out of the wax- and then use my finger to pick it off the brush. I have heard that some people have even thrown their wax brush in the washing machine - BUT NOTE - I do NOT advocate this since it may scratch the inside of your washer! The normal shedding does stop after a few uses!!!! I promise! The brush is round and easy to use on furniture as well on walls. The brush head is shaped by hand in the United States by a brush-maker with over 35 years experience. The quality is unmatched and its pricing is unbeatable. If taken care of, this brush will need to be noted in your will since it will last forever! If you plan on using both clear and dark wax- it is HIGHLY recommended you get TWO, otherwise you will contaminate your clear wax. The cleaning is simple, just dampen a soft rag with low odor mineral spirits and gently twirl the brush. This brush makes applying wax a pleasure when used correctly. Click HERE to read more about how to hold the brush so your hand does not cramp. Please rub the wax into the finish after brushing the wax on. Wipe off the excess wax immediately. The wax has cured when it is no longer tacky to the touch- and honestly- the tackiness should be extremely minimal immediately- if applying it correctly. Depending on the conditions of where you are located, temperature, and humidity- curing time may vary. Often we recommend to let it dry at least overnight prior to doing a final buffing. If The wax can take a good 24-48 hours to begin curing. How do you know how much wax is the right amount? Congratulations! You are the proud owner of a new Chalk Paint / Wax brush. Its hair is the finest Shanghai White Bristle from the cutest little boar in China! The ferrule is made with nickel plated steel for rust resistance- but that does NOT mean you can soak it over night. I personally recommend cleaning your wax brush with odorless Mineral Spirits. I first get a paper plate and use this to work on top of. I then get a plastic or paper cup, and typically pour a little amount of the mineral spirits in it (NOTE: do not use a styrofoam cup.) Pour just enough Mineral Spirits in the cup as so to cover the bristles about 1/4 to 1/2 inch up when the brush is standing in the cup. The Mineral Spirits will get absorbed and pulled into the bristles very quickly- like within seconds. 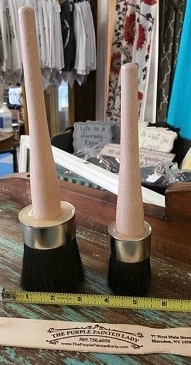 I then take the brush out of the cup, and using a paper towel or two, gently squeegee the wax out- starting from the ferrule and pulling the wax down and out- again, doing this very gently since we do not want to yank on the bristles as if to pull them out! Then- once done, you can gently wash the bristles with mild soap and water. Please remember not to break the bristles open or spread them apart when cleaning- you want your wax brush bristles to stay tight and compact. When disposing of your residual wax, just like bacon grease, never-ever pour this down your sink drain. Place the residual wax into paper towels or on a plastic plate. I then- thoroughly wet with WATER a few more paper towels and place them on top before carefully disposing. This is very important if you live in a state with hot temperatures, or if someone in your home is a smoker. Safety precautions are important. I hope this information was helpful and if you follow them- you should never need to purchase another wax brush from me. : ) Think of this maintenance just like regular oil changes for your car. In fact- when was the last time you did that? Some people have recommended using vegetable oil- I personally don't since if you do not get all the oil out- it can be a problem next time you go to use your brush. Google that process if interested.